Leading a DIY life has a lot of benefits. Depending upon what you are undertaking, you can save yourself a lot of money. You can teach yourself a new skill. You can work with your own schedule and budget. Or take some time to do nothing at all, knowing that it will still be there when you are ready. That’s exactly what happened to me this week, the third week of Jumpstart June. I took a break. I didn’t work on my Mary Blair inspired wall a single time. But you know what I did do? I swam with my kids nearly every day. I had saw my sister three times. I visited with two friends that I haven’t seen in ages. I watched a ton of baseball. I laid on the couch and watched Pitch Perfect. And then The Breakfast Club. And then Pitch Perfect again. And my wall looked like this the entire time. Even though I am a person who loves painting and being creative, I know that I need to take some time off in order for particular projects to be successful. It’s really important that DIYers like you and I embrace the process instead of just the end result. I try not to let my DIY projects bring stress to my life. Yes, this is a new leaf that I’ve turned over in the past year, but it has made me enjoy every aspect of a project and has helped to keep my frustrations at bay. This week, I’ll jump back into it and have this wall finished by the end of the month. Just one more week! How about you? 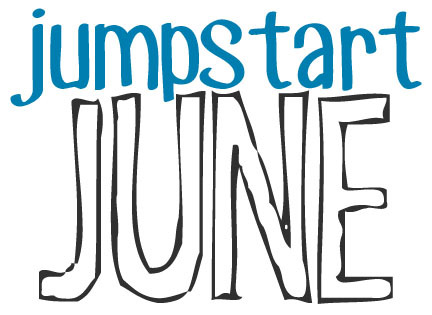 How did your Jumpstart June project go this week? 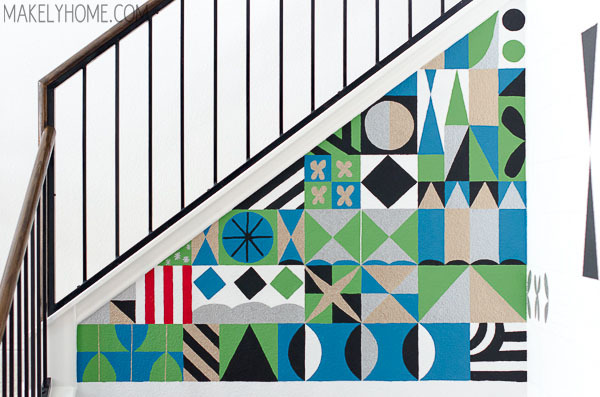 Do you think you’ll have it finished by the end of the month? so good to see you last week. E keeps asking for your E over and over again! Great to see the progress of work, you are to be congratulated, very beautiful! very good this content, congratulations! I confess my mind has opened up. Interesting article for those who want to know more information on this subject. You are in the right way, congratulations! Thanks for this posts! very inspiring! Very good! I think it’s essential to take the time to live, pay attention to children, just stay with them and play. This can be invigorating! I really enjoyed your work. Very inspiring! Congratulations! I find it very cool, manual work, it’s a therapy for the hectic world. Hello, your articles are incredible, thank you very much for sharing this information with us. Hug. Você quer passar na OAB? OMG Great content! Congratulations! Lindsay! Wow, I have to do these kinds of projects, because my life is very race, in fact every week of my life. Very cool! I loved creativity! Access and learn como desenhar passo a passo. Thanks for share with us!! Thanks for sharing! I liked the article! Sometimes the work takes so much of our time that we do not have time to swim with our children and not see our brothers and we do not have time to enjoy life, I adored their advice. The blog is amazing. Thank you for sharing with us. Great art work well professional and well structured. Great content! The staff is to be congratulated! The staff is to be congratulated! Informational article for those looking for this subject. Parabéns pelo site, excelente post. Very cool the mosaic of climbing. Colors are very vibrant! Congrats for the content, great! I guess everyone needs it sometimes. Congratz for the decision to take a break. I really want to do this in my life. Sometimes it is necessary to make a decision in our life. I had seen this decoration before, but I did not know the technique. It is practical. I loved it, it was beautiful.